Change at least every 6-months. But please note that in some "hot" marinas it can be neccessary to change the anode more frequently. 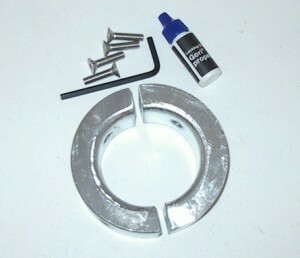 Remember to also order the "Gori End Anode" and perhaps the "Gori Rubber Stops". PLEASE NOTE. HR 40 MK II WITH RETRACTABLE STERN THRUSTER DO HAVE SAIL DRIVE, AND NOT PROPELLER SHAFT. PLEASE SELECT THE CORECT HR 40 RING ANODE.